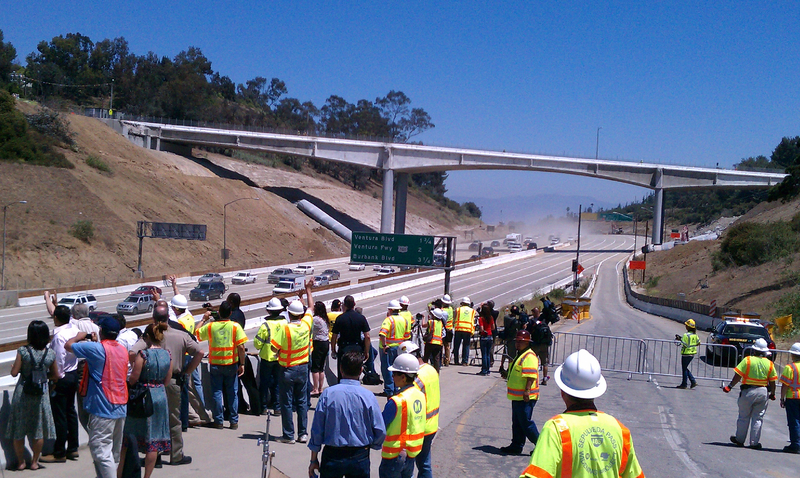 That was the scene a little while ago as the first wave of cars traveled over the Sepulveda Pass on the southbound 405. Congratulations to the residents of Los Angeles & to the construction company. If they did only half the bridge why not do it all and save people the preoblem of going through it again next year. Is it true that Kiewit gets a $300,000 bonus for finishing early? That is what is being reported on radio. Who at MTA or Caltrans or the City agreed to that boneheaded deal (if it is true)? Spending $1 billion for 10 miles is outrage. David (No last name) As I understand it, the Project would have spent $700,000 on law, fire and traffic services if the last 12 hour shift was required. So the incentive was the $700,000 saved by completing early $300,000 for the contractor, $400,000 not spent by the Project. Thanks for the information. I am a union member (non-public employee union) and our contract requires the employer to pay the employee for a day’s wages if less than 24 hours notice is given when canceling scheduled shifts/work. This is a very common part of all union contracts that I have been aware of. The amount of notification given before having to pay for scheduled work is what usually varies. I wonder how the Contractor and/or City/State got out of paying those employees if they were scheduled to work. Maybe the Police and Fire Unions don’t have this clause in their contracts and can be canceled for work with no notice thus not receiving pay.